Does your Stuart, Florida home need a new custom pool and spa? Home buyers in the Stuart and Port St. Lucie area place an inground swimming pool high on the list of real estate “must-haves”. Why? Because the gorgeous South Florida weather begs us to have fun in the sun with our families and friends almost year-round! There’s nothing like cooling off from the sweltering Stuart summers like a dive into your own backyard pool. Whether you prefer a glamorous lap pool for serious swimming or a natural river rock retreat with a waterfall and slide, you must choose the best Stuart pool builder for the job. An inground pool is a big project and a serious investment. It’s vital that you choose a pool builder in Stuart who has decades of experience and a long list of happy customers to back up their work. The best Stuart pool builder should have a wide range of experience in creating exceptional pool designs and the technological and swimming pool construction skills to complete the job on time and on budget, Choose a licensed pool builder who is happy to provide a complete consultation as well as a reasonable time frame for completing your pool and/or spa. The best Stuart pool building company will also volunteer to provide you with a list of satisfied customers for your review. 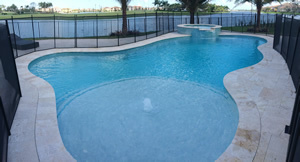 Why is Treasure Pools and Services the best swimming pool builder in Stuart? Treasure Pools and Services has been building new pools and spas in the Stuart area for decades. As a trusted South Florida swimming pool company, Treasure Pools and Service has proudly earned the A+ Rating from the Better Business Bureau. The licensed and insured swimming pool design and construction pros at Treasure Pools and Services never subcontract out any work, as too many South Florida pool contractors tend to do. All Treasure Pools projects are planned in-house and constructed by our own professional pool builders. This is the only way to be sure your project is done right at every stage. Treasure Pools and Services also offer pool remodeling, custom yard landscaping, deck construction, fabulous outdoor kitchens, elaborate stonework and custom mosaic tiling to enhance the beauty and value of your home. If the cost of a new Stuart swimming pool is holding you back, ask about Treasure Pools’ low-interest financing plans or their pay-as-you-go options. Frolic in the warm Florida sun with family and friends in your own Stuart new swimming pool and spa. Let Treasure Pools and Services build your outdoor dreamscape. Call today at (561) 793-1550 or 800-281-SWIM (7946) to transform your yard into your own piece of paradise.